ROAD TOWN, Tortola, VI – The BVI Taxi Association (BVITA) has reportedly been getting a favourable response to its recently introduced customers' cards. According to Mr Julio 'Sam' Henry, close to ten cards have since been returned to the taxi headquarters. "It is going very good so far. The word is spreading and it is catching on," Mr Henry told Virgin Islands News Online. He said twelve taxi drivers who are members of the BVITA have been furnished with five cards each and a customer has to travel five times to fill the card. "The fifth trip is free and persons are using the system," said Mr Henry. The card system is a move to attract customers and at the same time give back to customers. "The beauty of it is that our locals are making good use of the system," Mr Henry further stated. The BVITA is working to improve its relationship and services with customers and the card system is seen as one of the initiatives to help achieve those objectives. 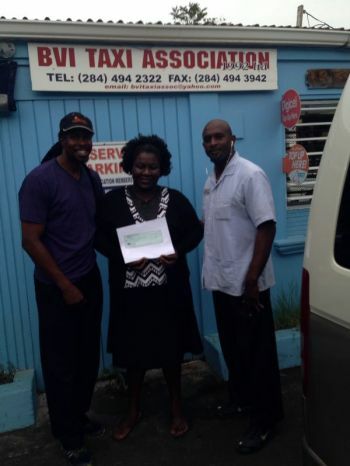 Starting today, December 5, 2013 the BVI Taxi Association is expected to roll out the first of several initiatives that are designed to see them being the “trend setters” in the taxi industry in the Virgin Islands (VI) with their customer card drive. The card is described as a reward card and is being introduced on the heels of the association’s general elections which now boast a number of members in new positions. “We will give our regular customers this card (display), it’s business size and it’s signed by each cab driver they ride with and the fifth ride is free. They pay for four and the fifth one is free,” said the newly elected president of the BVI Taxi Association, Mr Karl Scatliffe. According Scatliffe, they are keen on getting to the place where as an association they can give back to the community. He said they will also be implementing a customers’ comment card to facilitate feedback from their customers. The re-energized taxi association expressed that they are genuine in their efforts as they would be doing a number of things internally to improve their services to customers and at the same time giving the community a part of their benefits. They revealed that just yesterday December 4, 2013 they made a donation of $200 to the Rainbow Home, which is testimony of their efforts to re-establish their partnership with social groupings, organizations and other entities in the VI. “There was a time when we use to be part of the Disaster Management Unit, we will be working to re-establish that relationship with them and others too,” said Scatliffe. “We are also looking at branching out on a marine side of things. We, the BVI Taxi Association, this one, will be putting in a VHF radio and we are going to be doing a lot of marketing to the marine centre in some of the marine guides,” explained Mr Julio ‘Sam’ Henry, who was elected Assistant Treasurer at the recent elections, as he spoke to other initiatives of the BVI Taxi Association. At the special meeting, Mr Henry announced that they are also in the process of recruiting potential young BVIslanders to join the taxi industry. “Any youngster who is looking to get into the taxi business, we also want to help facilitate them getting licenses, maybe lobbying on their behalf, young BVIslanders we are focusing on,” said Mr Henry. He said the interested persons should have access to a car and be licensed drivers. He stressed that they have to come disciplined, ready to learn, ready and wanting to be in the tourism sector and understand good customer relations. Mr Henry added that this is all in the process of them working towards ensuring that the BVI Taxi Association becomes the premier taxi association. “We are looking also to help fill that void when cruise ships are in and we do not have enough operators to go around, we can have new drivers being a part of that,” added Henry. (Y) when u point one , four back at u ! what hjappen to the march eh? Oh now taxi men looking to us locals that have been here all the time for their next meal. Wow, you won't get my money for all the times you refused to give me service when my dollar was the same as the man with a different colour skin. Sam just loves to be in thing!!!! anything that reminds the surviving customers will remember they never came to eat, as the food was neither enjoyable nor digestible.